BuyEmergencyFoods.com is proud to offer the Legacy Premium line of gluten free freeze dried ready meals. 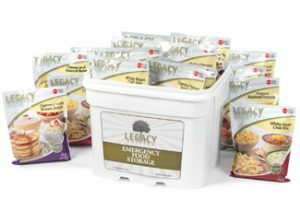 Most food storage companies don’t even offer gluten free options, but make sure you pick the best gluten free food storage supplier: Legacy Food Storage. Enjoy a large selection of truly delicious, long term emergency gluten free food storage. Each freeze dried meal comes in a sealed pouch that will keep for up to 25 years when stored properly. To prepare a meal just add water and cook for 10 minutes. Emergency Food Supply – Keep these freeze dried meals handy in case of emergencies. Keep a few days-worth of emergency food, or keep up to a year supply. Camping Meals – These gluten free, freeze dried meals from Legacy make fantastic options for meals for camping, hiking, RV or any outdoor setting. Everyday Meals – Because they are so delicious and easy to prepare, Legacy gluten free meals are a great option when you need to prepare a fast and tasty entrée for your family meal.